On October 22nd I went to a favorite area along the upper stretch of Bull Creek to see what changes several weeks of rain and our recent record cool weather had worked on the land. 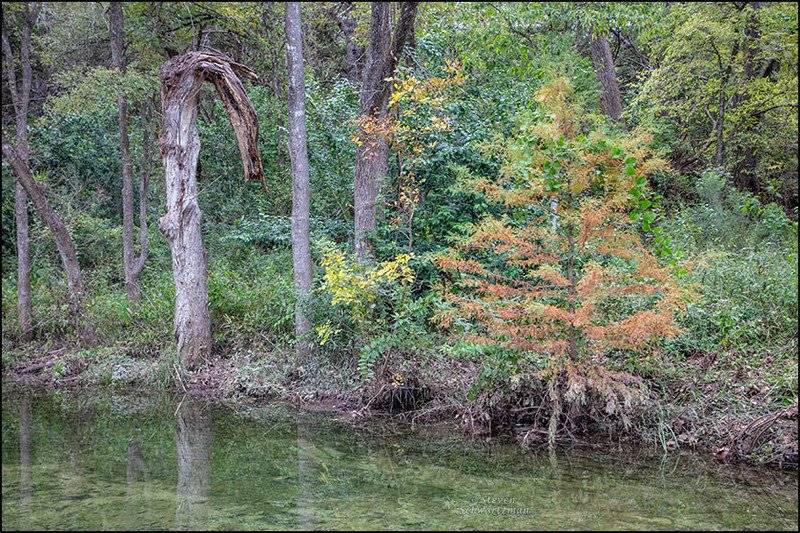 In the first picture below, notice how the young bald cypress tree (Taxodium distichum) at the creek’s edge was turning brown, as that species regularly does toward the end of the year. Also notice—as if you could miss it—the way the upper part of the dead tree trunk had almost completely changed direction but still hadn’t fallen. When I walked around and got close to the bald cypress tree, I found a native vine growing on it that I don’t remember ever having seen before: Smilax tamnoides (formerly S. hispida) known as bristly greenbrier and, imaginatively, hellfetter. Close to it I also noticed a “regular” greenbrier vine, Smilax bona-nox, which is very common in central Texas, so common that I almost never go walking in the woods without seeing one (and even having its thorns grab onto my clothing). Happy new species for me, and probably now also for thee. Fall down here mostly brings subtle changes, which can still be attractive. Very entertaining plant names – “The Bristly Greenbrier” would be a good pub, and “Smilax Bona-Nox” might be a villain from the Star Wars movies. Along those lines, we have to ask what you think the common name hellfetter might lead to. Let me add that the species name bona-nox is Latin for ‘good night,’ though I don’t know how greenbrier would give anyone a good night. Well, in my unfettered opinion, that would be a good name for a drink at the pub, maybe a bottle of tequila with habaneros in it, in the jug. Now you should get in touch with a beverage company to see about making and marketing the Hellfetter you’ve imagined. We wish you unfettered success. As a student of the Romance languages, let me add that although French says bonne nuit, Italian buona notte, Portuguese boa noite, Catalan bona nit, and Romanian noapte buna, Spanish stands out by pluralizing the expression to buenas noches. True, there’s some variation, even a lot of variation, in a language like Spanish that’s spoken over such a large geographic area comprising many countries. One thing that’s going on is that in some places, particularly in and around the Caribbean, Spanish speakers don’t pronounce syllable-final s, so the word that’s written este comes out sounding like ete, and what’s written buenas noches sounds like buena noche. The contrast between the cypress and the vines is attractive, but I’m even more fond of the way you’ve captured the transition of the cypress needles from green to rust. Those in my neighborhood are just beginning to change; I can’t quite see it if I look directly at the trees from a distance, but if I look at them a little sideways, there’s a hint of it. I like the way the vines echo the slant of the branches, too: a not-quite diagonal that’s quite nice. I don’t think I’ve ever seen the bristly greenbrier, but of course the other one’s everywhere. In fact, I’m sure I saw it both in the Nacogdoches woods and at the Sandylands preserve. It’s shown for those counties on the BONAP map, so it’s clearly an adaptable sort. I hadn’t thought about the transition of colors. From a distance I focused on the seasonably brown needles, and once I got close my attention quickly went to the prominent and unfamiliar greenbrier vine. What fun to find and photograph a native species that’s new to me. Of course the possibility exists that I’d seen it but without having it register. You mentioned BONAP. I see at http://bonap.net/Napa/TaxonMaps/Genus/County/Smilax that there are a couple of dozen Smilax species and that tamnoides covers essentially the whole eastern half of the United States. Central Texas marks the southwestern fringe of its range. The bona-nox apparently can’t tolerate the greater cold in the northeastern part of country. 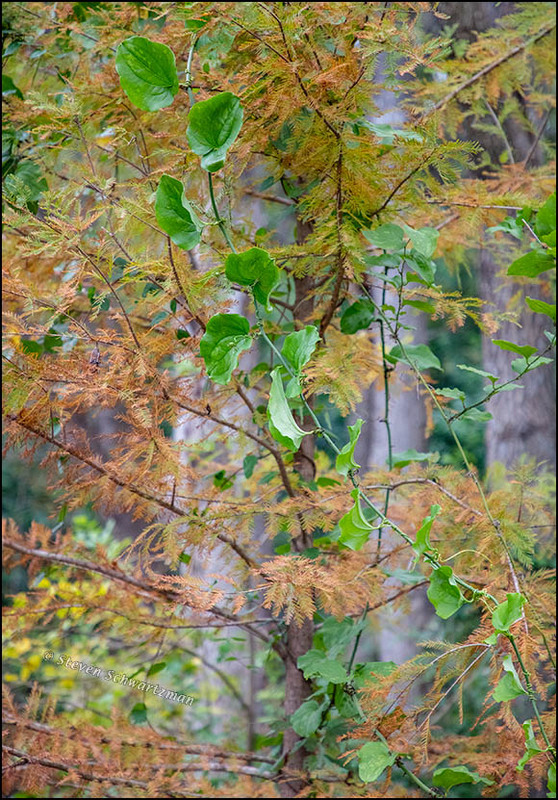 It’s amazing to see the bald cypress changing color like this. The one here is still green but this is South Florida. I will take another look later this month. I think they shed and replace their leaves in late winter or early spring. You raise the possibility that the bald cypresses as far south as where you are don’t change color as much as they do in a cooler climate, and that whatever changes they undergo occur later in the year. Ours don’t typically change this early but we’ve had eight weeks of mostly overcast skies and a spate of record cold temperatures. Our woodlands and the pecan orchard are prime spots to find greenbrier, or as we call it here, catbrier. Deer love grazing on it, and while raising fawns I spend lots of time harvesting it for supplemental browse. It often climbs high in the trees, creating cascades of leaves on thorny vine. Deer like the young leaf shoots of course, which are in the very tops of trees. The brier plant itself is quite easy to eradicate since the root isn’t deep in the ground and is easy to pull or dig up. The problem is that it grows densley in wooded areas and is almost overwhelming to get through a snarly patch of it. I always carry a knife with me on hikes, because like you, I’ve found it grabbing at my pant legs and sometimes it’s difficult to break loose of it. We don’t see many cypress trees here, but I think they’re lovely. I always marveled at them in the bayous and waterways of Louisiana. I imagine the name catbrier refers to the vine’s sharp “claws.” Are your woodlands home to this species with the rounded leaves, or to the other one with the somewhat heart-shaped leaves, or to the two of them? Both can climb pretty high in trees, from what I’ve observed and read. I’ve also read that people can eat the young shoots of Smilax bona-nox. I used to carry clippers with me but my camera bag got so heavy, especially with the 100–400mm telephoto lens I bought last year, that I no long bring the clippers along. I do remember using them once to free myself from a greenbrier vine that got too possessive. I’m sorry you don’t have more bald cypress trees up there. They’re pretty common along creeks in central Texas. They used to be even more common, and larger, before German and American settlers cut so many of them down. We have both kind of the brier species, but the heart-shaped are more prevalent. I didn’t realize the young shoots were edible. I may have to sample one…but I’ll research more before I try it! I have a lot of pants and jacket pockets. But like you, the camera can be heavy and my little tazer adds to that. I’ve never needed it, but sure as I didn’t take some items, I’d need them. I did lose a packet of kleenex on the last journey. I suppose when I stooped over to pick up some bones, they fell out of a shallow pocket. If you’ll remember from that last post on my hike, I collected several small skulls and jaws. After moving things around, the skulls ended up in the deeper pockets. At least they were biodegradable!! Better be careful admitting you have deep pockets or someone may be tempted to bring a lawsuit. On the other hand, I don’t think many other people would want to acquire a bunch of small skulls and jaws. I seem to recall tasting a new shoot once and finding it somewhat pea-like, as that article says. I can remember both of those from Oklahoma! Although I do not believe that the bald cypress is native to the specific area, it was the theme tree along the Oklahoma River where it flowed through Oklahoma City, in Oklahoma County . . . in OKLAHOMA! The smilax is native to the area, and climbed a chain link fence in the neighborhood. I thought it was weird, but took seed anyway. We happen to have two bald cypress at work. One is in the edge of a creek. The other is on the edge of a swampy lawn. In central Texas it’s common to find various vines climbing chain link fences. Among the most common are snailseed (Cocculus carolinus) and old man’s beard (Clematis drummondii). I’m not sure I’ve ever seen a greenbrier on a chain link fence, even though those vines are so common in the woods. I wonder whether there’s a tendency for people who see them on fences to cut them down. Bald cypress grows natively here, as you see, and in addition a fair number of them get planted by landscapers, occasionally even in places not near creeks or ponds. I missed both the snailseed and old man’s beard. I would not know if they are native in the middle of Oklahoma. I would have remembered a clematis if I had seen one. The greenbrier on the chain link fence was compelling not only because I had never seen a greenbrier before, but also because I was fascinated to see a chain link fence so far away from Los Angeles. It’s interesting that you’d associate chain link fences so much with Los Angeles. They were common on Long Island when I grew up in the 1950s, and they still are. My impression is that they’re pretty standard everywhere in the country. They were uncommon here because the region was developed after chain link became passe. Now we have those creepy tall redwood fences with lattice on top that make you wonder what the neighbor is hiding.